Ladies Madeline Liberty Print Tana Lawn Blouse. A Timeless print. A lovely blouse in deliciously soft Tana lawn. I like this pattern as it is not too dark. These blouses are a staple in my wardrobe, I wear them under sweat shirts and tunics. They are always comfortable. Really pleased with the blouse, lovely material and good fit. I will definitely order from you again. "A lovely blouse in deliciously soft Tana lawn. 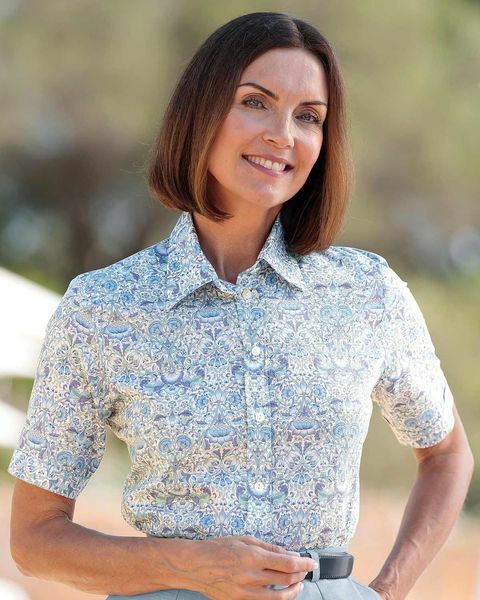 I like this pattern as ..."
Ladies classic short sleeved style blouse with mock turn back sleeves and gently rounded hem. Timeless Liberty print on pure Tana lawn. A pretty and versatile addition to any wardrobe.